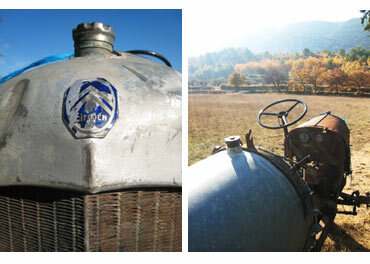 I’ve discovered an undeclared passion for tractors among the people of the Luberon. During the grape harvest, the lanes are filled with a stately procession: noble and ancient tractors rumble towards their local wine cooperative to unload, leaving a squishy purple Hansel & Gretel trail of mashed grapes behind them. And it seems that the older, the better. There is pride in length of service here. Today we came across a beauty: a pre-war Citroen, apparently enjoying a rusty retirement in a field. But as we stopped to admire it, up popped the owner, proudly claiming it to be in full working order, except for one part he was working on. Across the Luberon, thick silvery olive trees rustle, sway and chatter. For it is the olive harvest; when a seemingly innocuous ladder leaning against an olive tree means only one thing; that hidden inside, two or three olive pickers are braced against ancient branches, dropping olives to the nets below, and keeping warm with a flask of something or other. Picking olives is rather like combing the knots out of a head of unruly hair. A small plastic rake and a head for heights is all that’s needed. Local mills do the pressing and will let you watch as these unlikely black berries give up their oil; litres and litres of the delicious, fruity, peppery stuff. 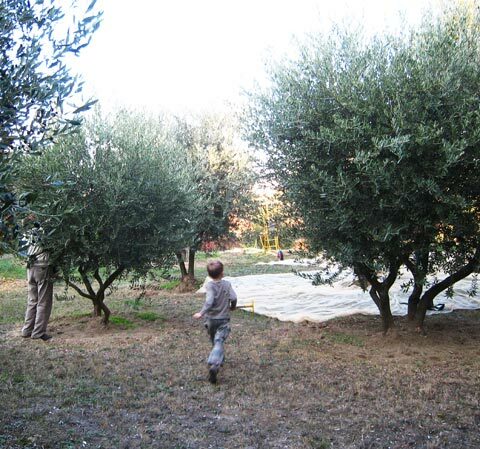 But the Luberon olive groves aren’t competing in the global oil market. Like much of Luberon production, this is thankfully another crop that the locals like to keep local. 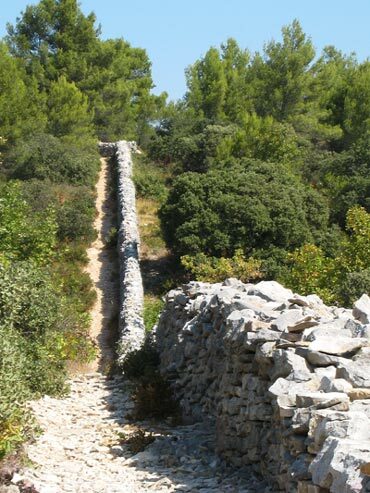 Fired up by my recent hike to the top of the Luberon, I attached a rucksack to the back of Child A and a compass to his shorts and we set off on a short ‘balade’ to educate ourselves on the ‘Mur de la Peste’. Marseilles first welcomed the plague to Europe in the 14th century, where it seems it had such success it became a repeat visitor, regularly wiping out more than half of the population. In 1720 someone had the extraordinary notion that a wall would keep it at bay – Le Mur de la Peste. Not surprisingly the plague took no notice and bounded on, unrestrained, towards Avignon and the rest of France. It’s a dry stone wall, once 2m high and 25km long. We picked it up at Cabrières d’Avignon, following little orange circles painted on trees along a stony track. Just as the ground begins to soften into a warm bed of pine needles, the wall appears, undulating away from us like a mini Great Wall of China. Today was the day I let a lovely local lass lead me up to the top of the Luberon mountain; a great hulk of prehistoric rock whose mood and colour changes on the whim of the sun: a 60 kilometre-long kaleidoscope. On a hearty breakfast of almost half a croissant we set off on a stony path from Oppede-le-vieux. White cliffs close in immediately on either side. These looming walls of limestone are studded with caves and at one point a perfect hole (‘the pierced rock’), shaped by both wind and water. For yes, this is one of those crazy places that geologists would have you believe was once entirely submerged, and that giant aquatic monsters cruised these caves before becoming unfortunately embedded as fossils. 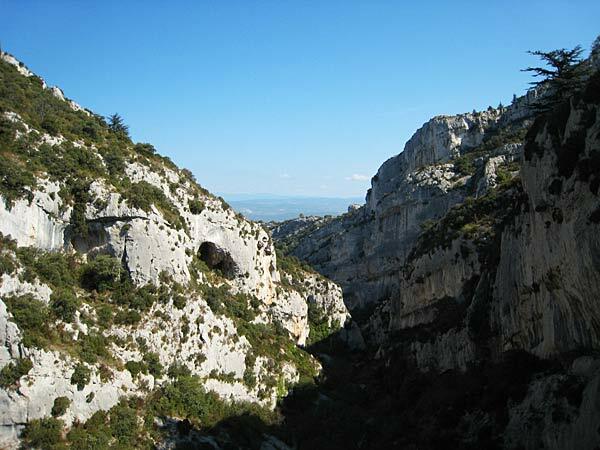 The Luberon chain of mountains first popped up around 35 million years ago, though it’s a mere 8 million years since the sea made her final retreat and the Luberon became what we see today. Hard to fathom as we climb the 2000 feet to the top. For a townie like me it’s a struggle and I take every opportunity to admire the view or a resting cricket while surreptitiously catching my breath. The Luberon is like a garden wall for our sheltered valley – once at the top we are dizzingly exposed – in the distance les Alpilles, l’Etang de Berre de Marseilles, the Mediterranean herself, Corsica, Africa…the feeling of adventure is undeniable. Wild rosemary, box and thyme give way to tall pines in whose shade we drink rosé and plan the next ‘randonnée’, though back down in the valley I’m not sure I don’t prefer my view of the mountain from our garden, gin and tonic welded to my hand.